The Skip Nymph keeps changing...hence, the arrival of the Hackled Skip Nymph. 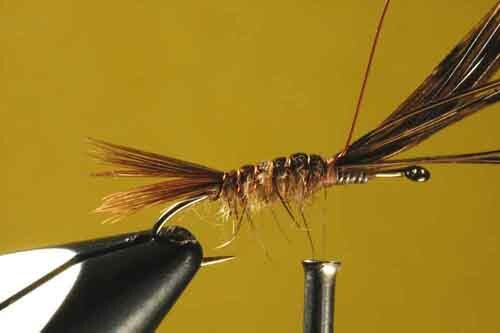 The original is a simple mayfly-nymph imitation I developed in the late 1980s. It has softly gleaming ribs defining its segmentation; cleanly split tails that stay split; a convincingly dark, mottled back and wing case over a lighter underside; and a pliant brush of fur and guard hairs projecting from the sides of its thorax as legs. It has taken trout—some cagey ones among them—from rivers and lakes across the US, in Canada, and even overseas. 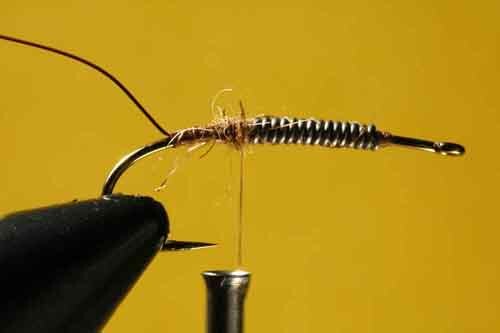 But not long after the Skip Nymph established itself in my tying vise and among the fish, I saw that it needed a little help when tied on big hooks to suggest big stonefly and the largest mayfly nymphs. So I began work on the Hackled Skip Nymph. Thing is, as the original version becomes larger, the guard hairs in its rabbit-mask or squirrel-fur thorax start to look insufficient, skimpy, as legs. 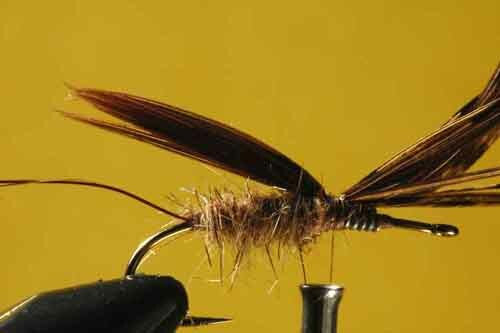 I'd tied so many fly patterns over my decades in the craft that I knew the options well. So I tried a few approaches, but one emerged as a natural: a supple one-sided hackle wound back over the thorax and then counter-ribbed for durability. It made a convincing spread of stout, supple fibers along each side of the thorax. The trout over a couple of seasons approved the addition, and I've tied and fished it that way ever since. The Hackled Skip Nymph is a big pattern for imitating big insects, such as nymphs of the salmon fly, golden stone, and skwalla stoneflies, along with the largest green drake mayflies. The version listed here is the versatile standard. 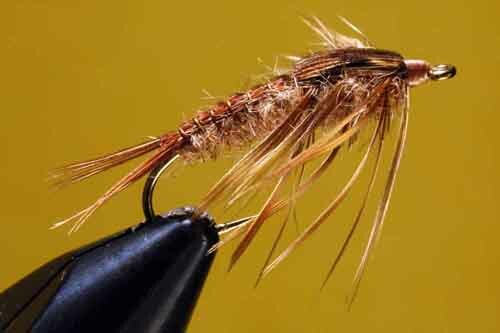 But I frequently tie it with dyed-dark-brown pheasant and fur: the Hackled Skip Nymph Dark. But, really, you can tie this fly in green, amber, pale olive, brown-and-gold—whatever seems right to suggest the nymph of the moment. For lakes it can be tied in colors and sizes that suggest damselfly and Hexagenia mayfly nymphs. I normally fish it right along the beds of trout streams below a strike indicator, standard river nymph fishing. For lakes, I generally fish it on sinking lines. Despite all this talk of imitation, you can fish a Hackled Skip Nymph any time, regardless of what the fish are eating—I've searched lots of hatchless, promising water with it, figuring the trout were open to a stout, natural-looking nymph with waving legs. Often, judging by the results, I was right. Bead (optional): A small black-metal bead. Thread: Brown 8/0, 6/0, or 3/0. Abdomen: Hare's mask fur or squirrel or rabbit in hare's mask color. Tails, Back, and Wing Case: Natural pheasant-tail fibers. Hackle: One mottled-brown or grizzly-dyed-brown hen-saddle hackle (sometimes marketed as "soft hackle"). 1. Wind a layer of lead (or lead-substitute) wire over the shank, leaving space at both ends. Bind the wire. Bind copper wire behind the lead. Dub a taper to the lead wire. 2. Dub a tapered abdomen to the center of the shank. 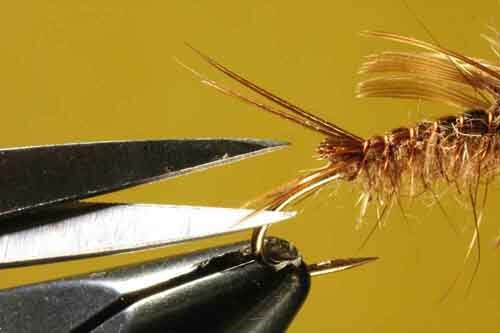 Bind a section of pheasant-tail fibers, with their tips evened, atop the center of the shank; the tips should reach past the end of the shank to normal tail-length. 3. Wind the copper wire forward onto the dubbed abdomen, one half turn. Pull the tips of the pheasant down and wind a firm turn of wire over them. Tug the fibers out to the sides into two groups. Tighten the wire a little more, and then wind it tightly up the abdomen as ribs. Bind the wire at the front of the abdomen—but don't cut it! 4. Double the butts of the fibers, and the copper wire, back and bind them. Strip the fluffiest fibers from the base of a hen-saddle hackle. Strip one side of the hackle. Bind on the hackle just behind the eye. 5. Dub the thorax-area. Wind the hackle back in three spirals. 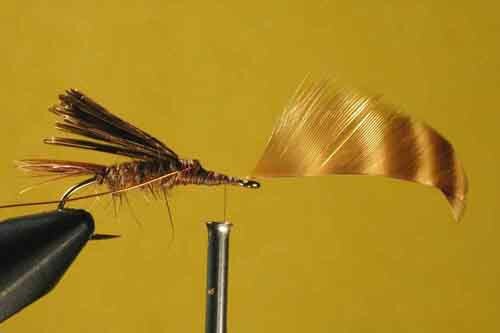 Hold the hackle back as you spiral the copper wire over its tip and then forward through the hackle to the eye. Bind and then trim off the end of the wire. 6. 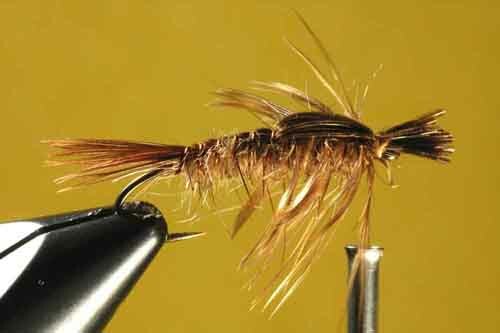 Part the hackle-fibers on top, pull the pheasant-butts forward as a wing case and bind them, trim off their butts. 7. Build a thread-head, and add head cement. 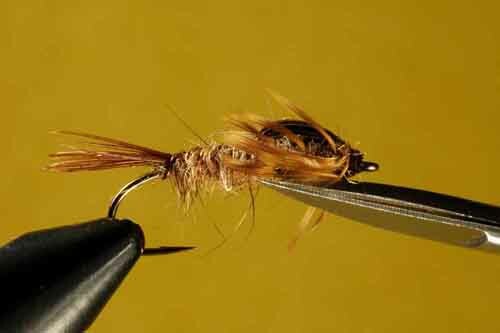 Trim off the hackle-fibers on the underside of the thorax. 8. 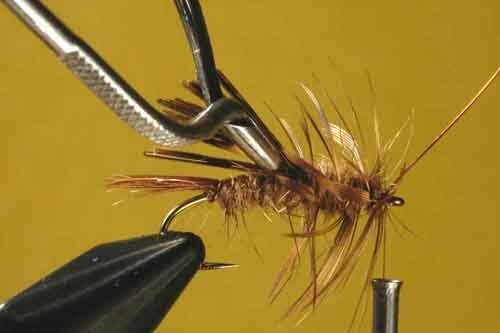 Trim out the center pheasant-tips, leaving three to five fibers on each side as split tails. There it is, the Hackled Skip Nymph, completed.